World Class race track – yet another reason Southern California is the Automotive Capital of the United States, and the World! In this iDriveSoCal Podcast we explore one reason why the SoCal region tops so many automotive world lists, with a look at our World Class Race Tracks. Numerous driving courses and tracks dot the Southern California landscape, allowing the average car-lover and driving enthusiast relatively easy access. Click play below to hear about some of exciting race track destinations to test your car’s limit – or try on someone else’s ride – and push your own personal mettle at the wheel. Clinton Quan: People always ask me, “Where are you going to get to drive a car with 500 horsepower or 600 horsepower? What’s the point of having a car like this?” And I always tell people, “Well, you go to a racetrack,” this is where you can take your car, and really experience it. Tom Smith: Welcome to iDriveSoCal, the podcast all about mobility from the automotive capital of the United States, Southern California. Tom Smith here, with the good Professor. Mr. Clinton Quan. Say hello, Clinton. Tom Smith: Hello. How you doing today? Tom Smith: Awesome. Thank you for joining us again, buddy. So, today’s podcast, every podcast we open up, I open up “From the automotive capital of the United States, Southern California,” that’s not exactly true. We’re really the automotive capital of the world. And Clinton and I have had some discussions about this. We are kind of in the middle-ish of a series of podcasts that we’re doing that talk about and justify why Southern California is, in fact, the automotive capital of the United States, as well as the automotive capital of the world. And today, the topic is racetracks. We have world class racetracks, racing facilities right here in Southern California, in our backyard. And the good Professor has been to the three that we’re going to talk about. We’re going to mention two others at the at the back end of this. But, take it away, Professor. Tom Smith: You’re not going to do it in the 405 in Russia. That’s for sure. Clinton Quan: Exactly. This is where you can really test your car and fully experience what your car can do. And for anyone who is a true automotive enthusiast, and they really, really enjoy driving, and they really want to see what their car can do, this is where you can take your car, and really experience it. Tom Smith: And that is? Clinton Quan: Well, three of my very favorites are Auto Club Speedway in Fontana. Clinton Quan: Willow Springs International Raceway in Rosemont, which is near Lancaster. Clinton Quan: … in Thermal, California. Tom Smith: And we’re going to touch base on each of those. Tom Smith: But then, I promised two outliers that we’ll probably not going to get too, but let’s just throw those out there real quick. Clinton Quan: Chuckwalla out in the desert as well. It’s a little bit further east of the Thermal Club. Clinton Quan: And there’s also the Porsche Experience Center. It’s not really a racetrack, but they do have different racing modules, and we’ll get to experience the variety of Porsche vehicles at that facility. Tom Smith: And, now, back to the top three that you mentioned, the Auto Club Speedway in Fontana. Tom Smith: We’ve actually done a podcast with them, and they have events all year round. Tom Smith: You have your exotics racing experience. Clinton Quan: Out there up in Speedway. Clinton Quan: The big race is Auto Club 400, the big NASCAR race. So, that is the biggest race of the year at that venue. It’s the most well-known race. They’ve had that race there for … This is the 21st year they’ve had this, the Big Auto Club. Clinton Quan: That’s a car race. Tom Smith: … on a real race track. Clinton Quan: Well, that actually takes place in the parking lot where they set up a racetrack. Tom Smith: Oh, it’s separate. Clinton Quan: Yeah, it’s not on the oval track. Clinton Quan: Yeah, the big oval track, that’s a two-mile track. And that’s really set up for the big NASCAR race. They actually used to do IndyCar racing there as well. Tom Smith: Actually, that does remind me, I remember. And Roger Penske was one of the founders of it originally. I don’t believe he’s part of it anymore, but that’s what the main intention was for that track originally. Clinton Quan: Yeah. And I was lucky enough to actually go in a customized IndyCar, and I sat behind the driver. It was actually a prize I won at a go-karting facility in Corona, also in the Inland Empire. So, I actually got to sit in an IndyCar going 180 miles an hour. And maybe, that just might have been the scariest thing I’ve ever done, three laps. Tom Smith: Three laps at? Clinton Quan: 180 miles an hour. And remember, this is an IndyCar. So, it’s an open car. It’s not enclosed. So, you can feel everything. Tom Smith: Yeah. Well, and then, of course, you did your recent Media Day at the Long Beach Grand Prix where you did 150. Clinton Quan: So, that was very similar. Tom Smith: In that same similar situation, right? Tom Smith: And we actually have a picture of it. Clinton Quan: On a street course, yes. Tom Smith: Right, right. I mean, I don’t know. 180 on a course that’s intended to do a 180 or 150 down in a city atmosphere with buildings flying by. Tom Smith: I think, I might be a little bit more scared on the second of those too, but, yeah. Tom Smith: But okay, so, we have Auto Club Speedway, Fontana. Willow Springs, tell me about that. Clinton Quan: Well, Willow Springs, it’s the oldest permanent road course in the US. And it’s actually a motorsports park facility. So, they actually have eight racetracks there. But the two that are the most well-known, the Big Willow Racetrack, and then Streets of Willow, which is one of my very favorites. I remember when I had my Audi TT there, I took it out on the Streets of Willow. And that is just a really, really fun course, a very technical course, lots of turns, elevation changes. And it’s just an absolute blast to drive your car there. Clinton Quan: You can drive through with different organizations such as Speed Ventures. They’ll do autocross there in the parking lot, or they’ll do, I think, it’s called a roval, where it’s a combination of the road course, the inside road course and the outside. So, that’s why they take the R with the oval, and called it a roval. Clinton Quan: Yes, a roval. Tom Smith: It’s kind of fun to say, right? Tom Smith: Right. Does Willow Springs rent anything or do you just bring your own? Clinton Quan: I believe you can rent. I believe there are sports cars or race cars that you can rent. I don’t know how much it would cost. But, also, you know, if you do bring your own car, you have to get it … There’s an inspection process. Clinton Quan: … before you can take it out on the track. But it’s a completely different experience because Willow Springs, it is a road course; whereas, Auto Club Speedway, there’s also an oval track. So, you can probably drive on the oval too if you go through one of the racing schools. Tom Smith: But by road course, there’s twists, and turns, and lefts, and rights. Clinton Quan: Yes, that’s exactly what it is, lots of turns. Tom Smith: But you’re not on a public street. Clinton Quan: Yeah, it’s a 2.5-mile track. Tom Smith: Okay. So, we have those two open to the public. Bring your own or rent something. But then, the last one, the Thermal Club, this is special. I know you’ve been to it. I’ve never been to it, but I’ve seen … In the Midwest, I read a couple articles about these types of clubs that were starting up, and what was on plan for them. And, basically, folks, it’s the equivalent of like a really expensive country club. Tom Smith: But take out the golf course and the golf clubs and insert supercars and a significant multiple of expense. But, oh my gosh. Clinton Quan: This is also the home of the BMW Performance Driving School. Tom Smith: And that’s how you got in? Clinton Quan: That’s how I got in. I got invited to drive the M cars. So, that’s how I got this opportunity. And when I was invited, I knew I had to take advantage of it because there might not be another chance for me to drive this racetrack. Tom Smith: This was the one that you actually missed the birth of your son for, right? Clinton Quan: No, no, no. This is totally different. Tom Smith: Yeah, I’m kidding. This is totally different. No, he didn’t actually miss his son’s birth for an automotive event. But that’s another story. Clinton Quan: That’s a different … Completely different event. That was a Lexus event. Tom Smith: But he didn’t miss his son’s birth, to be clear, everybody. That’s funny. But so, the Thermal Club, it’s super special. Clinton Quan: It’s a private club, yeah. Tom Smith: We don’t even know for sure. Clinton Quan: Yeah. Well, I did get it. I got a tour of the property. and I was told that there’s a membership fee. Tom Smith: I was told that you don’t have nearly enough money. Tom Smith: So, we’re not even going to pitch you. Clinton Quan: Yes. So, you have to buy a plot of land, and then you have to build a property there within a certain amount of time. And these are homes. Clinton Quan: It’s like a vacation home. Tom Smith: Yeah, second or third residence, whatever. Tom Smith: I’m going to go to a Thermal Club for the weekend, and drive my millions of dollars worth of cars. Clinton Quan: Yeah, and you can throw a party with your friends who are also sports car enthusiasts. Clinton Quan: And if they want to drive their cars there as well, they can do that too. Tom Smith: Yeah. And if anybody that actually has a spot there who wants to invite us, you can find us right here at iDriveSoCal.com. Tom Smith: So, go to the contact page, and we will be happy to entertain all invitations. So, these are additional reasons why Southern California is the automotive capital of, not only the United States, but the automotive capital of the world. And that is our racing facilities, our racetracks. Not only, I guess, the variety that we have, but then, also, the concentration that we have in a relatively tight space. So, again, those are the Auto Club Speedway in Fontana; Willow Springs, which is? Clinton Quan: in the Antelope Valley. Tom Smith: And the Thermal Club is where? Not that they’d let us in. Clinton Quan: In Thermal, California, which is in the Coachella Valley, on the eastern edge of the Coachella Valley. Tom Smith: Okay. And then, we have the two outliers that are worth mentioning. Clinton Quan: There’s also Chuckwalla, which is also a newer facility, and that’s also out in the desert, a little bit further east of Thermal. Tom Smith: Okay. And that is open to the public, right? We should probably make our way out there. Clinton Quan: Yes, that one is open to the public as well. 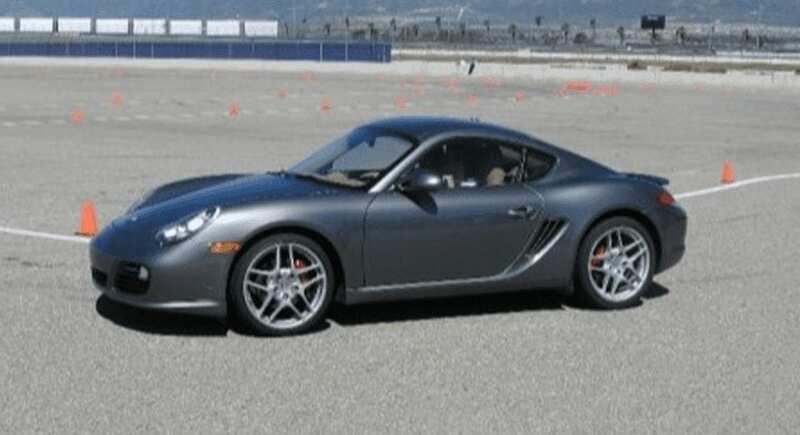 Tom Smith: And then, of course, the Porsche Experience Center, which is right off of the 405 in Carson there. Clinton Quan: Yeah. 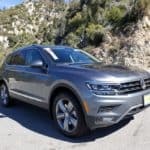 So, on pretty much any given weekend, you’re going to find a number of automotive enthusiasts driving their cars or one of the cars at the facilities, and really experiencing what these vehicles are really capable of doing. Tom Smith: Yeah. You know, that’s probably another whole element of the equation of Southern California being the automotive capital of the world is our concentration of automotive enthusiasts, right? Clinton Quan: Yes. And that’s why you’ve got clubs such as the Porsche Club. They’ve got … There’s a Porsche club for LA. I think they even have one just for the San Gabriel Valley. There’s one for the Inland Empire, and there’s one for Orange County. Clinton Quan: There’s one for, I think, Santa Barbara Ventura County as well. Clinton Quan: Well, they have events pretty much on monthly basis. Tom Smith: Is it like a Facebook group, or meet-ups, or something? Clinton Quan: They actually have their own websites. Clinton Quan: It’s a neat place. Yeah. Tom Smith: All the Cars and Coffees that we have around here. Clinton Quan: Yeah, it’s amazing, all over Southern California. Tom Smith: I’ve considered listing them on the website, but many come and go. Tom Smith: Yeah, it got too big. It got too popular. Clinton Quan: It got too big. I went one year, and I remember, wow, I was just blown away by how many people attended and how many cars there were. It was amazing. And for something that takes place that early in the morning, and for people to get up that early just to check out cars. Tom Smith: Just to get up, and have some coffee, and go hang out with other car lovers. Clinton Quan: In a parking lot, that shows you how many car enthusiasts we have. It’s like upward. It’s amazing. And that has just really spawned all these other Cars and Coffee. World Class Race Tracks – Surround SoCal! Clinton Quan: All of this other cars and coffees. 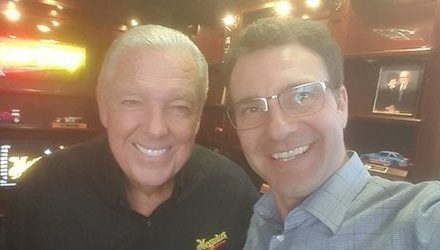 Tom Smith: Well, I did a talk with Barry Meguiar, one of the first podcasts that we did. And, you know, he was kind of one of the founding fathers of Cars and Coffee; although, he hung the hat of, really, the key person behind it, he and his wife. I want to say he was a designer or a PR guy at Ford, but this is going back a long time ago because the original cars and coffee actually started in Crystal Cove before it moved and bounced around a little bit. Now, it’s gotten so big that it dissolved then, I think, 2015. And, now, it’s a couple of different spots down the sea. Clinton Quan: Yeah. There’s, I think, a newer one down in San Clemente, I believe. Clinton Quan: At the outlets. Clinton Quan: Out in San Clemente. Tom Smith: Yeah. Anyway, we’re getting off topic again, which Clinton and I do. But, nevertheless, Southern California, the automotive capital of the world, definitely automotive capital of the United States for so many reasons. This podcast, again, was about the plethora of racetracks and opportunities for the average guy, the average gal to hop in their car and take it on a track. Very few places in the world can you do that. And here, in SoCal, you sure can at a number of different places. So, without further ado, are you good? Tom Smith: Okay, I’m good too. Thanks again, buddy. Good to see you. Always good to chat. For iDriveSoCal, I am Tom Smith. Thank you for listening.